STEP into a world of pure imagination when the curtains open on the spectacular new musical Charlie and the Chocolate Factory at the Capitol Theatre. Based on Roald Dahl’s much-loved story about a boy named Charlie Bucket, the musical features songs from the original 1971 film starring Gene Wilder including I’ve got a Golden Ticket and The Candy Man. NewsLocal readers can get their own golden ticket with 68 double passes up for grabs to a January 9 performance. Australian theatre producers John Frost and Craig Donnell have helped bring the musical to Sydney to make its Australian premiere. “It’s a magical concoction ready to satisfy any sweet tooth looking for a golden ticket,” Frost said. We are giving away 68 double passes to Charlie and the Chocolate Factory at 7.30pm on January 9, 2019, at the Capitol Theatre. To enter, go to NewsLocal.com.au/competition and follow the prompts. This competition closes 5pm on August 13; winners drawn on August 16 and will be published on the NewsLocal.com.au/competition page on August 17. Authorised under permit number LTPM/18/03101. 4.Entry is open to all NSW residents over the age of 18 except employees and immediate families of the Promoter and their associated companies and agencies and participating outlets. Immediate family means any of the following: spouse, ex-spouse, defacto spouse, child or step child (whether natural or by adoption), parent, step parent, grandparent, step grandparent, uncle, aunt, niece, nephew, brother, sister, step brother, step sister or 1st cousin. 7.The competition commences on Monday August 6 2018 at 9:00am AEST and concludes on Monday August 13 2018 at 5:00pm AEST. Entries must be received by the Promoter prior to the competition close date and time. 15.The winner/s will be the first valid entry submitted in accordance with these terms and conditions that is drawn by NewsLocal by random computer selection at 12.00pm on Tuesday August 14 2018 at NewsLocal, 2 Holt Street, Surry Hills, NSW 2010. 18.The winner/s will be notified by telephone or email within 14 days of the draw. Winner/s of prizes will be published on NewsLocal competition page at newslocal.com.au/competition on Wednesday August 15. 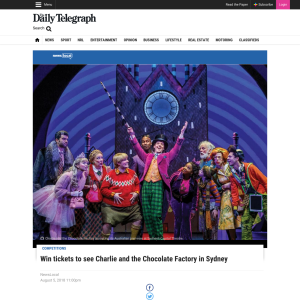 •68 x double passes to Charlie and the Chocolate Factory on January 9 2019 at 7.30pm Capitol Theatre Sydney. 28.Prize must be taken on January 9. In the event a winner does not take the prize by the time stipulated, then the entire prize will be forfeited by the winner and cash will not be awarded in lieu of the prize.